The Adani group had applied for the Northern Australia Infrastructure Facility loan for building the 388-km rail line to connect the Carmichael coal mine to the sea port. 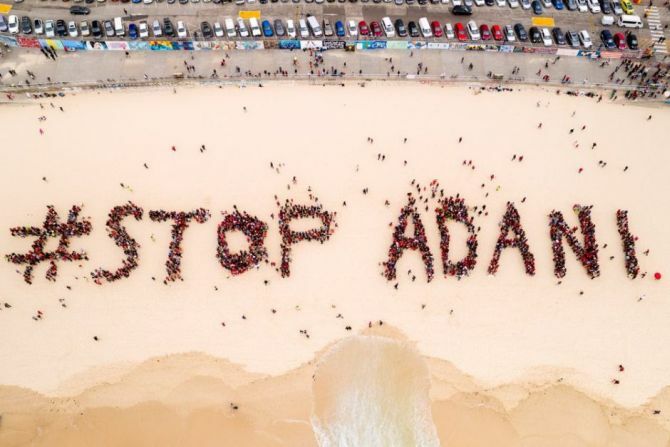 Image: A Stop Adani sign formed by people on Bondi Beach, Sydney, Australia. In a setback to India's energy giant Adani, the newly-elected Queensland government has vetoed a plan to give a $900-million concessional loan for the construction of a rail line in the controversy-hit Carmichael coal mine project in Australia. The Adani group had applied for the Northern Australia Infrastructure Facility (NAIF) loan worth $900 million for building the 388-km rail line to connect the major coal mine to the sea port. The $16.5 billion Carmichael coal mine project is one of the world's largest. Queensland Premier Annastacia Palaszczuk, after being sworn in, wrote to Prime Minister Malcolm Turnbull to veto an almost $1 billion concessional loan for the Adani mine, Brisbane Times reported. She also tweeted a photo of her letter, fulfilling a major poll promise she had made during the election campaign to put a stop to the NAIF loan on her first day. "As I committed during the election campaign, I have today written to the Prime Minister exercising Queensland's veto over any NAIF funding for the Adani rail line," she said in a tweet. Earlier last month after reports of conflict of interest emerged, Palaszczuk said her government will exercise its 'veto' to not support the NAIF loan to remove doubt about any perception of conflict. Meanwhile, an Adani Australia spokesperson said in a statement that the company will now fully consider and adjust to the constraints the veto of NAIF funding brings. "We would not be investing our time, money and energy in this manner if our projects were not viable and if we were not serious about delivering our projects which will ultimately generate more than 10,000 direct and indirect jobs across all of our projects," the statement said. Adani Australia currently employs over 800 people and has invested over $3.3 in Queensland, which is one of the biggest investments by an Indian company in Australia, it said. "We congratulate Premier Palaszczuk on her government's election and look forward to working closely and cooperatively with the state and federal governments and regulatory authorities as we get on with the job of making all of our projects a reality. "In particular, the Carmichael Mine has been verified by independent third parties to be in the first quartile of the cost of production in the global cost curve for seaborne thermal coal," the statement said. The projects are viewed in a positive light by the Queensland government and considered as critical infrastructure investments, it said, adding that the projects continue to retain the support of the Queensland government. Adani Australia is 100 per cent committed to Queensland. "Adani Australia's Carmichael Mine and associated infrastructure, along with all of our Australian projects, will strengthen the relationship between Australia and India, creating even more opportunities for trade and jobs into the future," the statement added. Earlier this month, China's two major state-run banks said they have no plans to finance the Carmichael coal mine project. The Indian energy giant has for over five years battled the opposition to any expansion of the Abbot Point port, saying it will cut into the Great Barrier Reef World Heritage Area.